Helping To Find What Drives You. Compare Toyota To The Competition Here. When thinking about your next vehicle, there are LOTS of things to consider… gas mileage, comfort, safety, longevity, and perhaps most importantly, the cost of ownership. Rest assured that Toyota measures up, and measures up fantastically well against the industry’s other best selling models. Use the handy comparison graph on the specified model pages to see how well your Toyota model compares to other vehicles. New to the site? Choose a Toyota model in the navigation bar above and you will be taken to a page that not only features all the details on that particular model, but will also let you choose other comparable models from other manufacturers to see how they stack up! How Toyota Safety Sense™ helps keep you safe! DETROIT — In the latest move by a major automaker to enhance its American manufacturing operations, Toyota said on Monday that it would invest more than $1.3 billion to upgrade its assembly plant in Kentucky. The announcement follows a push by President Trump for auto companies to expand in the United States, and it follows similar actions by General Motors, Ford Motor and Fiat Chrysler. The investment will not add jobs at Toyota’s plant in Georgetown, Ky., but a company spokesman, Scott Vazin, said the investment “solidifies its commitment” to manufacturing vehicles in the United States. At the start of the new millennium, Toyota made some aggressive moves to expanding its line of vehicles and capture more of the market. Refocusing and inventing new ways to appeal to consumers has paid off. Amidst the recession in 2008, the company eclipsed General Motors to become the biggest manufacturer of automobiles in the world. TOYOTACARE COVERS NORMAL FACTORY SCHEDULED MAINTENANCE FOR 2 YEARS OR 25,000 MILES, WHICHEVER COMES FIRST. 24-HOUR ROADSIDE ASSISTANCE IS ALSO INCLUDED FOR 2 YEARS AND UNLIMITED MILES. THE NEW VEHICLE CANNOT BE PART OF A RENTAL OR COMMERCIAL FLEET, OR A LIVERY/TAXI VEHICLE. SEE TOYOTA DEALER FOR DETAILS AND EXCLUSIONS. VALID ONLY IN THE CONTINENTAL U.S. AND ALASKA. ROADSIDE ASSISTANCE DOES NOT INCLUDE PARTS AND FLUIDS, EXCEPT EMERGENCY FUEL DELIVERY. 2015 CENTER FOR AUTOMOTIVE RESEARCH STUDY. JOB AND EMPLOYMENT FIGURES INCLUDES TOYOTA’S LEXUS DIVISION. 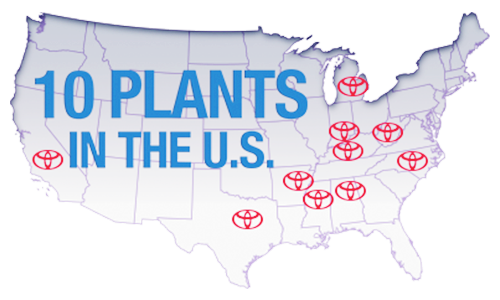 CAMRYS, COROLLAS, HIGHLANDERS, SIENNAS, SEQUOIAS, TACOMAS, AVALONS, AND TUNDRAS AND COMPONENTS ARE ASSEMBLED IN THE U.S. USING U.S. AND GLOBALLY SOURCED PARTS. AS OF 2016. Insurance Institute for Highway Safety rating for 2019 Camry, vehicle class Midsize Cars. 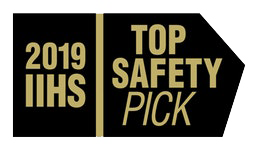 For more details on 2019 Top Safety Pick Plus Awards, see www.iihs.org. Applies to Camry models when equipped with LED headlights. Vehicle’s projected resale value is specific to the 2019 model year. For more information, visit Kelley Blue Book’s KBB.com. Kelley Blue Book is a registered trademark of Kelley Blue Book Co., Inc.